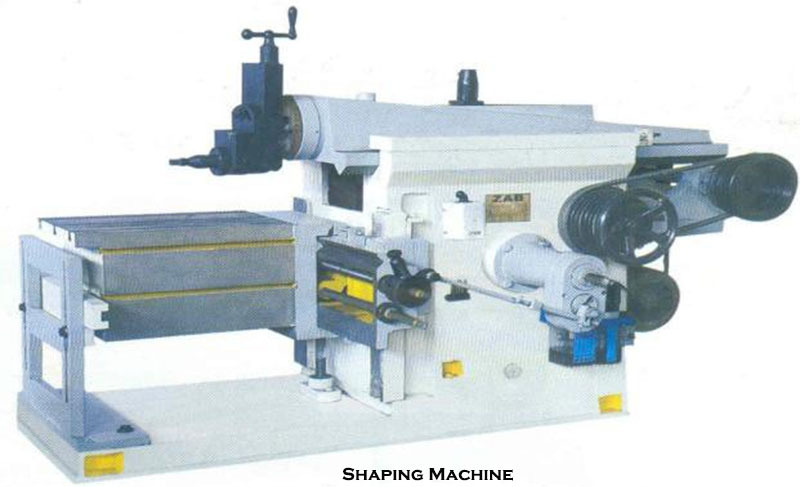 (a) The main purpose of shaping machine is to machine plane horizontal surface. (b) It is possible to form vertical and angular surfaces also. With proper tools and accessories even irregular surfaces can be formed. (a) As Per Type of Motion. (b) As Per Position and Travel of Ram. (c) As Per Design of Table. (d) As Per Cutting Stroke. (a) Crank Shaper - The most common type of shaping machine is the crank shaper, in which the motion of its ram is being derived from a crank, a crank block, and a crank pin. The shaper size is known by the largest stroke of the ram. Usually it ranges from 12” to 36” with 24” being the most common. (b) Gear Type Shaper - The reciprocating motion of the ram in this type of a shaper is obtained by means of a rack and pinion. The speed and the direction in which the machine will traverse depend upon the number of gears in the gear train. This type of shaper is not very widely used. (c) Hydraulic Shaper - In a hydraulic shaper, the reciprocating movements of the ram are obtained by hydraulic power. Oil under high pressure is pumped into the operating cylinder fitted with a piston. The end of the piston rod is connected to the ram. The high pressure oil first acts on one side of the piston causing the piston to reciprocate and the motion is transmitted to the ram. The piston speed is changed by varying the amount of oil delivered by the pump. One of the most important advantages of this type of shaper is that the cutting speed and force of the ram drive are constant from very beginning to the end of the cut. (d) Horizontal Shaper - In a horizontal shaper, the ram holding tool reciprocates in a horizontal axis. Horizontal shapers are mainly used to produce flat surfaces. (e) Vertical Shaper - In a vertical shaper, the ram holding the tool reciprocates in vertical axis. In some of the vertical machines, provision is made to allow adjustment of the ram to an angle of about 100 from the vertical position. Vertical shapers may be crank driven, rack driven, screw driven, or hydraulic power driven. (f) Travelling Head Shaper - In a travelling head shaper, the ram carrying the tool while it reciprocates, moves cross wise to give the required feed. Heavy jobs which are very difficult to hold on the table of a standard shaper and fed past the tool are held static on the basement of the machine while the ram reciprocates and supplies the feeding movements. (g) Standard or Plain Shaper - A shaper is termed as standard or plain when the table has only two movements vertical and horizontal, to give the feed. The table may or may not be supported at the other end. (h) Universal Shaper - In a Universal shaper, in addition to the two movements provided on the table of a standard shaper, the table can be swivelled about an axis parallel to the ram ways, and the upper portion of the table can be tilted to second horizontal axis perpendicular to the first axis. As the work is mounted on the table, it can be adjusted in different planes. A universal shaper is mostly used for tool room work. (i) Push Type Shaper - This is the most general type of shaper used in common practice. The metal is removed when the ram moves away from the column, i.e. it pushes the work. (j) Draw Type Shaper - In a draw type shaper, the metal is removed when the ram moves towards the column of the machine, i.e., draws the work towards the machine. The ram is generally supported by an overhead arm which ensures rigidity and eliminates deflection of the tool.